Sugar Cookies just got better with a little pumpkin! 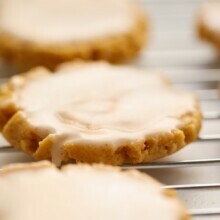 This recipe creates soft, chewy, lightly spicy glazed pumpkin sugar cookies that are perfect for Fall! While cookies bake, stir all ingredients together for glaze until smooth.